A group of celebrity chefs with outposts in white-hot Las Vegas gather for a cool 4th of July picnic in the Nevada desert. Most people wouldn't pick a place called the Valley of Fire for a picnic, but then most people don't work in broiling professional kitchens. Chefs, it seems, have a different relation to heat than the rest of usespecially chefs with restaurants in white-hot Las Vegas. "We were even playing touch football right on the rocks," says chef Paul Bartolotta, of Bartolotta Ristorante di Mare in Wynn Las Vegas. "It was pretty crazy." 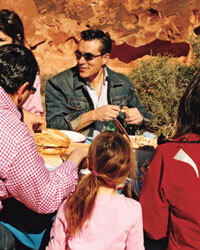 For this Fourth of July picnic in the desert, Bartolotta and his friendsincluding Todd English of Olives Las Vegas, Bradley Ogden of Bradley Ogden in Las Vegas and Wynn Las Vegas's executive vice president of restaurants, Elizabeth Blaudrove to Valley of Fire state park, an hour outside Vegas, for a mini vacation. The picnickers passed around a few dishes of their own, plus some from star chefs who couldn't attendthis time, at least. Bartolotta's rich Italian tuna, white bean and arugula salad brought the Mediterranean to the desert. English came with a picnic classic, potato salad, enlivened with three kinds of mustard. And Craftsteak's Tom Colicchio added peperoncini (pickled peppers) to his lemony chickpea salad for a tangy bite. Once the salads were set out, the group started unwrapping sandwiches. Smoky bacon and crumbled blue cheese made Ogden's crispy chicken subs irresistible. Emeril Lagasse of Emeril's New Orleans Fish House Las Vegas supplied piquant muffulettas, stuffed with salami, mortadella, provolone cheese and olive salad. For dessert, pastry chef Sherry Yard of Wolfgang Puck's Spago (which has a Las Vegas outpost) contributed flaky, buttery, bite-size nectarine tartshow many, no one knows. They were devoured so quickly there wasn't a chance to count them.